At the Autumn Equinox, I committed to creating and nurturing community in my life. I strongly believe that remembering our communality with each other and the natural world is what will make all the difference as old certainties crumble. This was never going to be easy. I grew up as an only child, and I’m naturally an introvert. Reaching out to people doesn’t come naturally. It feels very vulnerable to make connections outside my comfort zone. This is something I’m going to have to learn how to do. My first task is to strengthen my trust. Trust that all will be well. That I will be held. That I can survive rejection. The Earth Herself is the obvious place to start. I can be absolutely certain that the Earth will hold me. She doesn’t reject any of her children. She nurtures and feeds all of us, gives us all that we need. She holds all of us, from birth to death and beyond. That is objectively true, as well as emotionally reassuring. To strengthen this bond with the Mother Earth, I have returned to my core practice of putting down roots. In meditation, I imagine my roots reaching deep and wide into the Earth like a tree’s. The connection comes alive when I send love and blessings for the Earth down my roots. And when I listen for an answer, I feel a reassuring strength rising through me. It is a magical connection, vibrant with life force. As it happens, trust, truth, and trees have a lot to do with each other. The etymological roots of all these words are related. Trust is derived from Proto-Germanic *treuwaz-, “to believe, trust”. Trust comes down to believing that something or someone is true and has integrity. True comes from the same source, which traces back to the Proto Indo-European root *deru-/*dreu- “be firm, solid, steadfast”. This root also has the more specialised meaning of “wood, tree”. So learning how to trust by mimicking a tree makes a lot of sense. I know that in the days since I re-committed to that practice, I have been feeling much calmer about my life and its challenges. 1) Sit down, preferably outside, and notice your breathing. Just pay attention to how your breath moves in and out of your body. How it stretches muscles with each in-breath and lets them relax on the out-breath. 2) Notice where your body touches the Earth and imagine roots growing from the base of your spine into the soil beneath you. Feel touch of your weight on the ground. With each out-breath, let yourself relax into the Earth. Feel yourself sinking your roots deeper as you breathe out. 3) Send your love and appreciation for the Earth down your roots. Send blessings with every breath. Do this for a while, until you feel a clear flow of love into the Earth. 4) Listen for the Earth’s response to your presence and your blessings. Just become aware of the feelings and impressions that come back to you. Don’t second guess yourself. Allow the feelings to flow without resistance. Stay with them for as long as you like. 5) When you are ready to return to your daily life, bring your attention back to your breathing. Feel the breath entering and leaving your body. Feel yourself separate from the patch of soil you were sitting on, but always connected to the Mother Earth. Move gently back into your life. This connection to the Earth is your birthright as a human being. It is a great source of strength and support. Where could you use some extra support? Could the Mother’s strength help you? I’m very curious about your experiences with this practice. Please let me know how it works for you. 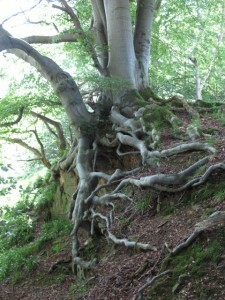 For more suggestions about growing roots and mimicking a tree, sign up for my free course, The Magic of Connection. hi! Reading your literature has struck a chord in me, as I have experienced such strong feelings, almost overwhelming, when I am out with nature. It would be good to channel this somehow but I’m unsure of these emotions. Its like a wave of ‘full up ness’ that pulsates, like I could dissolve into it. Sorry but those are all the words I have to try to explain. I’m glad this post resonated with you. The feelings you describe are like what I feel when I practise my meditations and rituals. I think of it as feeling my essential one-ness with Nature, with All-That-Is. You can cannel those feelings into anything you are passionate about. It is the creative force of the Universe. Use it to create something amazing.